Gibraltar - Europa 2009 ~ Astronomy issue: 4 Stamps (Copernicus, Newton, Galileo, Aristotle) of differing values totaling £2.46. Printed in sheetlets of 8 of each value. One interesting aspect of this issue is the use of actors portraying each individual to accomplish a photgraphic portrait. 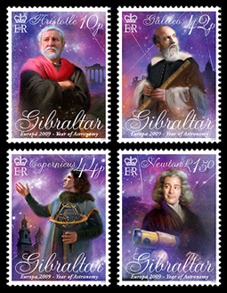 The Europa 2009 "Year of Astronomy" Gibraltar stamp issue marks the 400th anniversary of the first use of an astronomical telescope by Galileo Galilei and pays tribute to Aristotle, Galileo, Copernicus and Newton. The aim of the Year is to stimulate worldwide interest, especially among young people, in astronomy and science. Aristotle was a Greek philosopher who treated astronomy in the abstract, linking it to his overall philosophical world picture. Galileo Galilei was an Italian physicist, mathematician, astronomer, and philosopher who played a major role in the Scientific Revolution. Nicolaus Copernicus's book, De revolutionibus orbium coelestium (On the Revolutions of the Celestial Spheres), is often regarded as the starting point of modern astronomy and the defining epiphany that began the Scientific Revolution. Sir Isaac Newton was an English physicist, mathematician, astronomer, natural philosopher, alchemist, and theologian and one of the most influential men in human history. In this work, Newton described universal gravitation and the three laws of motion which dominated the scientific view of the physical universe for the next three centuries, advancing the scientific revolution. 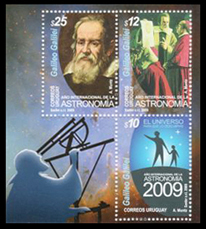 El Salvador- IYA 2009 ~ Astronomy issue: Four stamps issued of four designs: a telescope, an observatory, moons and Galileo. Uruguay sounvenir sheet with three stamps of three different values. The sheet design features a background image of a man looking through a telescope that overlays an image of a portion of the Eagle Nebula. The three stamps, aside from carrying different values also contain different designs. The 10 UYU value stamp carries the IYA2009 logo, shaped within a form reminicent of a planetary or lunar limb. The 12 UYU value stamp depicts a historically based image featuring Galileo among the Vatican inquisitors. 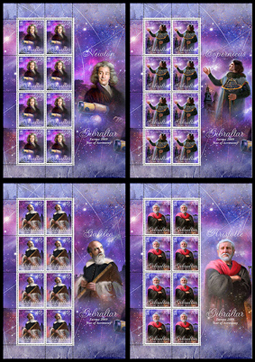 The final stamp, valued at 25 UYU features a potrait of Galileo. These later two designs also share the "limb" shaping element to draw attention to main image feature of the design. 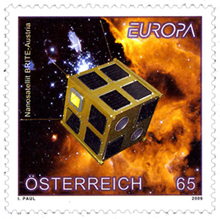 Europe 2009 - Astronomy: On the occasion of the International Year of Astronomy, the Europa 2009 commemorative also looks at this topic -- or to be more precise the launch of the first Austrian nanosatellite TUGSAT-1, developed for the BRITE Austria (Bright Target Explorer) mission. 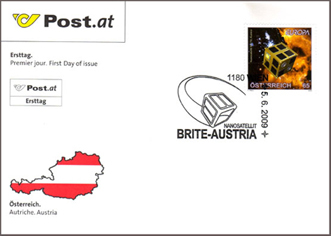 Austrian FDC with postmark depicting the BRITE nanosatellite. Norway - Europa 2009 ~ Astronomy issue: 2 motives. The 10 NOK value depicts the Sun with a large prominance arcing from its surface. The 12 NOK value depicts our Moon. 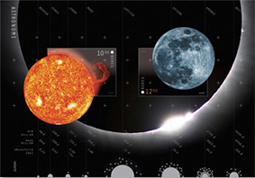 Norway - Europa 2009 ~ Astronomy issue: Astronomy issue in miniature sheet form (with a combined value of 22.00 NOK) carries both stamps and also features a large image of a solar eclipse in the background. The limb on the right side of the sheet depicts the "Bailey's Beads" effect and some flares erupting from the Sun's surface. Across the bottom of the sheet is a diagram of the planets in our solar system with a table of information regarding each, such as - their maximum and minimum distances from the Sun and the number of years it takes the planets to circle the Sun. The sheet also displays the full image of the bodies featured on the stamps. The silver ink of the text and brilliant colors of the images make for a very handsome design against the predominantly black sheet. One should make special note of the fact that actual "meteorite dust" has been sprinkled next to the country name on both stamps. Turkey - Europa 2009 ~ Astronomy issue: 2 motives, one valued at 80 Kurus¸ (pictured at right,) features the Cacabey Astronomy Medresse (located in the center of Kõrs¸ehir and was built in H. 671 / C.1272-1273) set against an image of a galaxy (M 31? ); while the second stamp, valued at 1 Lira (pictured at left,) depicts famous astronomer Ali Kus¸çu (1403-1474) working on a document and surrounded by images that include Earth, the Moon, Saturn, portions of a chart and some Turkish tileworks.